If you would like to be notified when the Opti CS150 Control Station becomes available please enter your email address here. 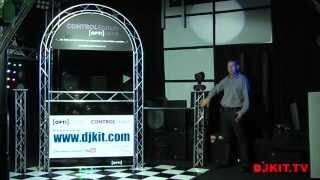 The Opti CS150 Control Station Mobile DJ Booth is a sleek portable DJ Stand, with it's unique design making the system easy to assemble. The Opti CS150 Control Station is a high-impact visual solution for any mobile DJ or Club DJ Setup, also it can be used for AV presentations, exhibitions and conferences with it's eye-catching design and endless customisation options with Opti Trilite Trussing attachments. Considering purchasing the Opti CS150 Control Station? Have questions? Ask people who've recently bought one. Can I project from behind and get a decent image? I'm thinking of running a projector behind it for karaoke? Can the booth be set up by one person? Also is the booth supplied with carry bag for all bits. I am interested but I am trying to get the weight down. Yes this can be set up by one person, not tricky, not difficult, takes between 3 & 6 minutes depending how quick you rush after you get all the pieces out of the 2 bags which are not supplied. The genuine bags are available from this site too for about £200 total. A very sturdy booth which looks great. Takes a bit of room but a valuable visual asset to any mobile setup. Do you own the Opti CS150 Control Station? Why not write a review based on your experience with it. Was torn between the CS150 and the lite console. In the end went for the CS150 due to it being cheaper than the lite console aswel as having 2 podiums for my moving heads attached. It literally takes 30-40 secs to construct and looks the part. Only regret is not buying it earlier. I love it, and so does everyone at my gigs. Had this booth for over a year now and was definitely worth the money. Looks professional whether your at your local social club or historical castle (peckforton) takes literally 3 minutes to set-up. The only downside in reality is getting it back in to the bags....it takes longer to put it back into the bag then actually set up in the first place !! Great purchase apart from the expensive fiddley bags !! I bought this opti cs150 recently and I couldn't be happier. I put it up in less than 3 mins and it not only looks amazing it's so functional. DJ kit was amazing and the courier DPD Brilliant. very highly recommended. Very good unit I have tried many types of this types of this desk and this one for me was the best. powered coating on the unit which was extra was excellent. Firstly; Steve @ DJ kit very helpful Awesome bit of kit !! Totally customisable :) Very pleased with it !! Have overhead & podium set on order. 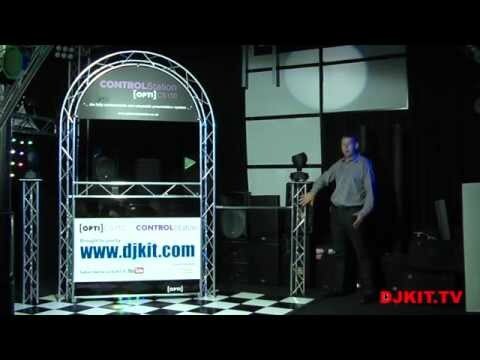 Very pleased with coms from DJ kit, also manufacturers have been very helpful with advice on how to fly speakers from over head trussing, also made me on request a 3D file of Opti 150 for use in lighting software visualiser. If you purchase this bit of kit, you will have no regrets ! Great price, great delivery and a great product. Very impressive. Really pleased that I made the plunge and bought one. Fantastic product, the quality you would expect for the money. Two comments though to the manufacturer would be, front panels need a vertical centre support bar as very flappy. Rubber coating or some form of anti slip surface required on the shelves. Otherwise would highly recommend this product as a complete out of the box solution. Perfect product for me. Good space, lightweight and still robust construction. It looks very nice and professional to. The ideal solution for any mobile DJ. DJ Kit delivered it to Sweden very quickly! Easy to set up Smart looking a lot of compliments all ready would recommend buying the bag as well!!! This equipment will win you business in the long run! Fantastic bit of kit, great to give my clients a choice of stands. So far they have all chosen the CS150! This is a great effect if you want to create a professional looking setup. Perfect for mobile DJ's!! Seen a video for Opti CS150 Control Station online or have you own video? Check out Opti CS150 Control Station on DJkit.com!